Some foods just seem meant for each other… peanut butter and jelly, lox and cream cheese, hot dogs and mustard. One of my all-time favorite flavor combinations has to be eggplant and tahini. The rich creamy flavor of sesame tahini paste, when stirred together with tender roasted eggplant, turns into something magical. It’s like smoky, creamy perfection. These two foods were destined to be together. You can make the dip ahead and refrigerate for up to 2 days. If making the crostini, let the dip come to room temperature before serving. If you’re rather not go to the trouble of making crostini, feel free to use this mixture as a dip or mezze. The dip itself is gluten free, which means if you’re on a gluten free diet you can serve it with vegetable crudite or GF crackers. The dip is also vegan, and if you use a vegan baguette/bread, then the whole dish becomes vegan too! If making as a dip, I recommend doubling the recipe so you’ll have enough to go around. This stuff is addictive! 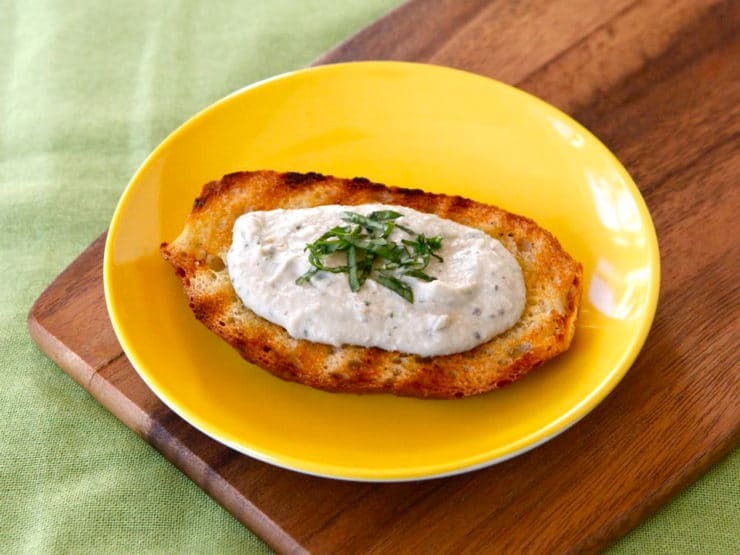 Smoky roasted eggplant with creamy sesame tahini, lemon, garlic & fresh basil top grilled sourdough slices to make a healthy, delicious crostini. Roast the eggplant till very soft, scoop out the flesh with the smoky juices and discard the skin. Learn how to roast an eggplant. Place the roasted eggplant flesh in a mesh strainer in the sink and let it drain off excess liquid and return to room temperature. Roughly chop 1/2 tbsp of the basil leaves, reserve the rest. Combine roasted eggplant, tahini paste, fresh lemon juice, olive oil, crushed garlic, salt and the 1/2 tbsp chopped fresh basil in a bowl. 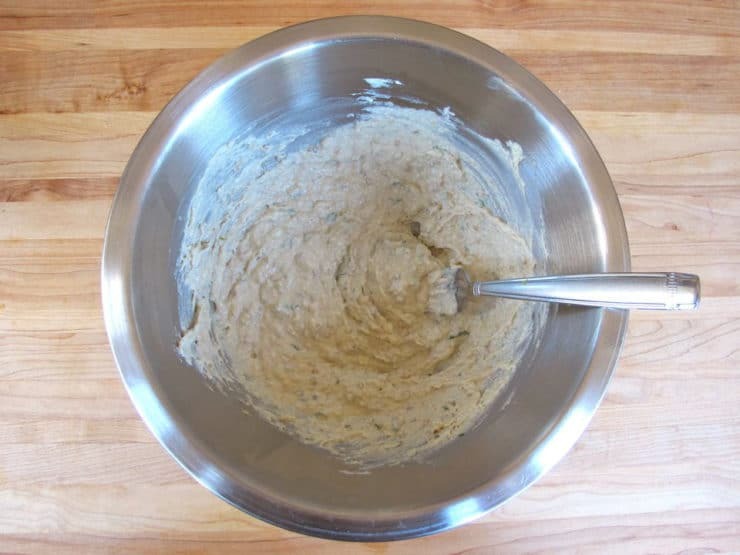 Use a fork to mash the mixture together till smooth, creamy and dip-like. Break apart any stringy pieces of eggplant with the fork. Taste the eggplant; add more salt or lemon juice to taste. 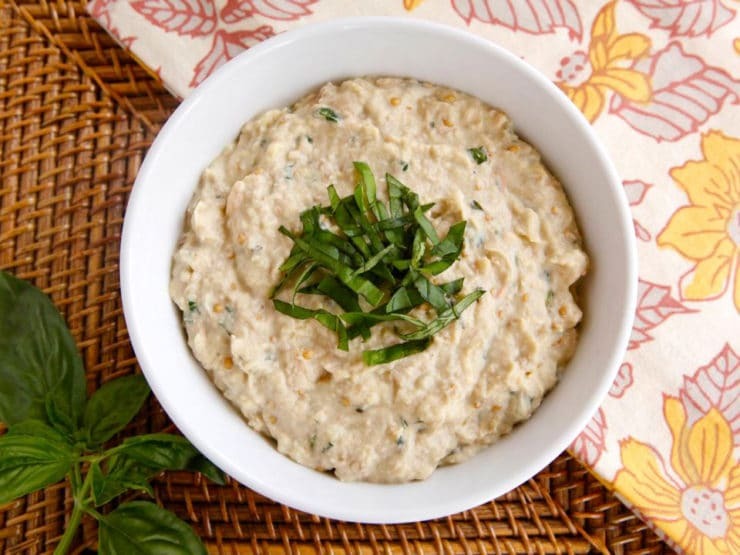 At this point, the mixture may be served as a dip in a bowl garnished with some fresh chiffonade-cut basil (see directions below), or you can make crostini with it. If serving as a dip, I recommend doubling the recipe to make a larger amount. If making as crostini, read on! 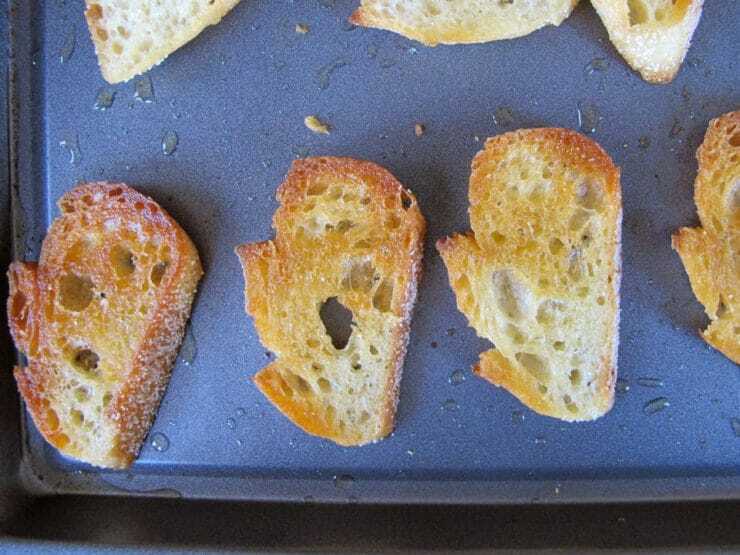 To make crostini, preheat grill to high or oven to 400 degrees F. Slice the baguette along a diagonal into 1/4 inch slices using a serrated knife. Do not slice them thicker than 1/4 inch, or they will be difficult to bite through when toasted/grilled. Brush the slices with olive oil and sprinkle lightly with salt. If cooking on the grill (recommended), place slices on the grill and let them cook for 3-5 minutes till toasted golden brown with grill marks. If cooking in the oven, place the bread into the oven and let it toast for 8-10 minutes till the bottoms of the bread slices are golden brown and toasted. Flip the slices to check for doneness-- they will brown more on the bottom than they will on the top. Once toasted, remove from the oven and allow to cool. Chiffonade-cut the remaining fresh basil. Start by piling up 6-8 basil leaves on a cutting board, one atop the other. 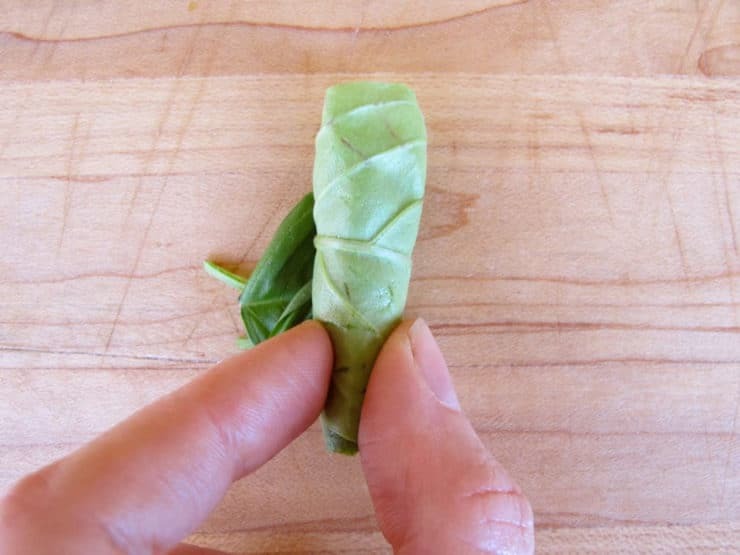 Roll the leaves up, starting from the tip end and rolling inward towards the steam, to create a tight roll of leaves. 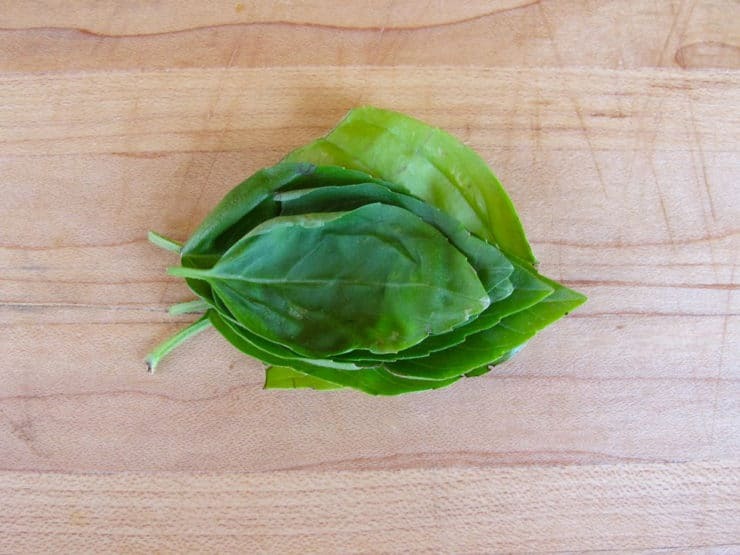 Slice the roll of leaves into thin strips at an angle to create long, thin pieces of basil. Repeat process with remaining basil. Top each baguette slice with 2 tsp of the eggplant dip. 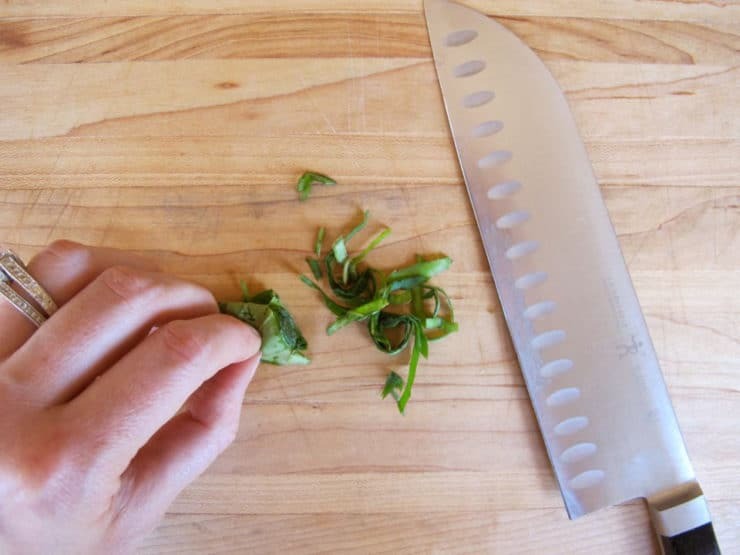 Garnish each slice with a little chopped basil. Serve. 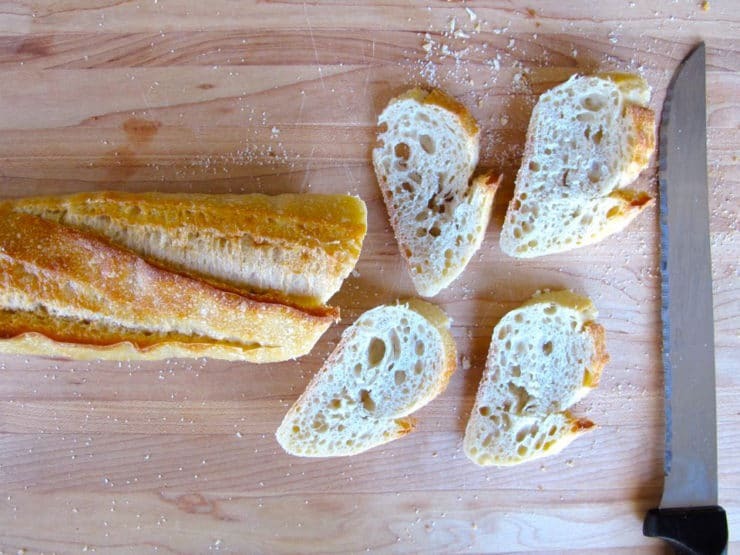 Gluten free modification - omit baguette, serve as a dip with with gluten free toast or crackers. Just made the dip…delicious! We only had rye bread so I toasted it and used that instead, nice accompaniment. I just had this for dinner with fresh tomatoes from the garden and it was amazing. I have never put fresh basil with eggplant. So glad you liked it Rebekah! I wasn’t so sure when I first put the basil in if it was going to taste like it did in my imagination… luckily it turned out great! Not only does the recipe sounds good the way you plates it looks beautiful, on the yellow plates almost like a Fried egg w/ yolks on the outside: I suppose that´s coming from an artist point of view…… beautiful!!!! I just had a grilled eggplant falafel wrap with tahini, last night for dinner! Great idea to put Baba Ghanoush on crispy sourdough, instead of using flatbread !! Thank you. Yum I love this sephardic twist on crostini! And all i had for lunch was 2 corn dogs. Yummy! thay ment to be together…. Wow this sounds great and I have eggplant from the garden!!! This sounds delicious and I´ve never been a fan of eggplant (pretty much only seen it as Parmesian) or the way I loved it was when my Mom thinly sliced it, salted it, then she pressed it (to remove the water) and put it in a canning jar with oil and spices. I don´t even know how to spell the name. 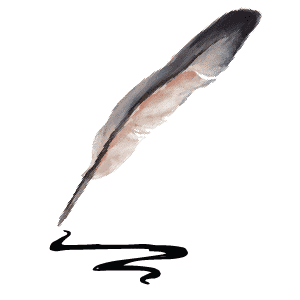 Phonetically it is Moulanjoni (Italian). I can’t wait to make this for my son. I will use GF bread. Thank you for the recipe. OH 2 of my fav´s! I just HAVE to try this one! That looks good and I never cared for eggplant.. Saw cool looking white eggplant at farmers market, but had the dark ones at home already! Eggplant parmagan is my most favorite eggplant dish! 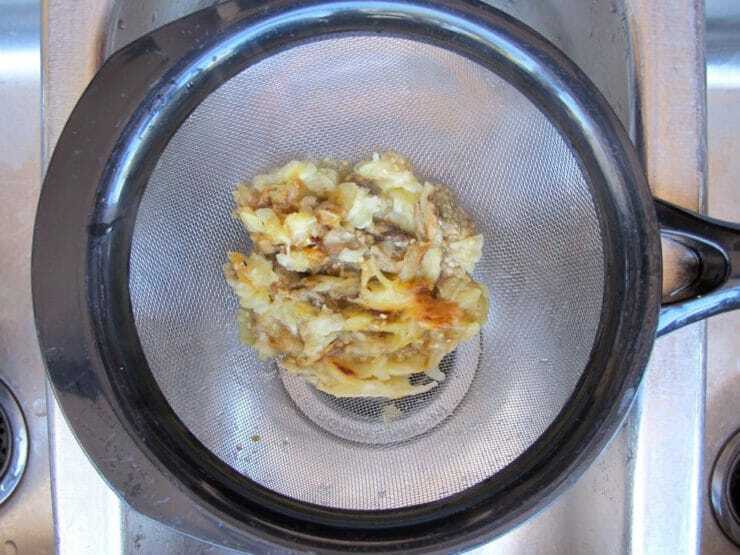 Just put in the over, your KUGEL! Thank you! Yelena Leychik love it!! Thanks for sharing. Thank you for giving us real recipes, and a real taste of home! Shabot Shalom! I wish I could 3D print that right now.